I’m a huge fan of Pitch Black and The Chronicles of Riddick. Though different, both are excellent. I love Vin Diesel too. Hence, I had a lot of hope for Riddick, the third in the series. Unfortunately, try as I might, I just can’t like this film and I’m not surprised the film bombed badly. Before I outline the plot of Riddick, it’s worth revisiting the prior two films. Although both were written and directed by the same man, David Twohy, and both star the same actor playing the same character, they are remarkably different films. Pitch Black is more traditional science fiction with a narrow story taking place in a confined area. It is a character study as a handful of stranded characters struggle against an enemy that exists only in science fiction – a flock of blood-drinking, flying creatures who live in the dark, with the first half involving discovery of the creatures and the second half escape. This story was well written, well acted, well shot, and all around created a truly immersive experience for the audience, who had no problems believing what they were seeing. 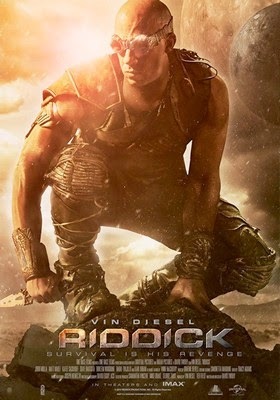 The Chronicles of Riddick, by comparison, was a much more expansive tale. This one involved a marauding army of religious fanatics who want to wipe out or convert every non-believer the universe, and they do it by destroying planets. 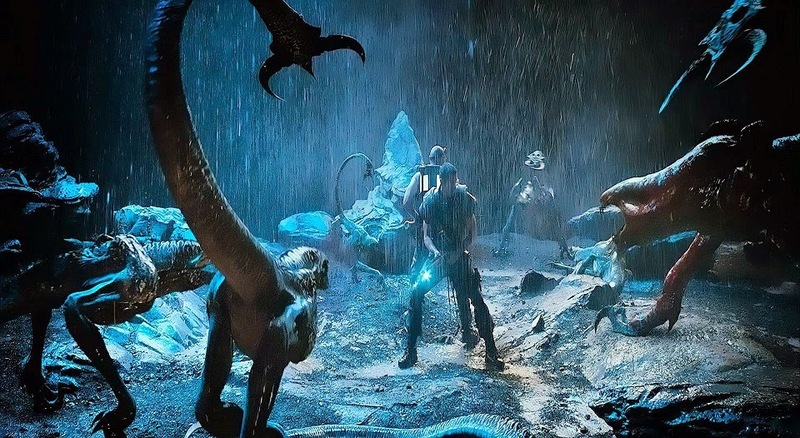 In this story, Riddick travels to multiple planets, engages in any number of fights or battle scenes, and ultimately destroys or saves millions of people. There is little introspection, no mystery, and less science fiction than action. Nevertheless, this film too was well shot, well acted and well written, and the result was a different but nearly equally enjoyable film. As these two films were so different, the question became: would Riddick be more like Chronicles or more like Pitch Black, or would it be something else entirely? Well, the story opens with Riddick getting betrayed by the Necromonger army he conquered at the end of Chronicles. 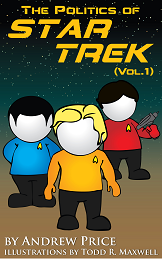 He finds himself stranded on a desolate, hostile planet as a result. At first, he works to heal his significant wounds and master his environment. He befriends a dog creature. Then he essentially summons mercenaries (bounty hunters) to the planet so he can escape. 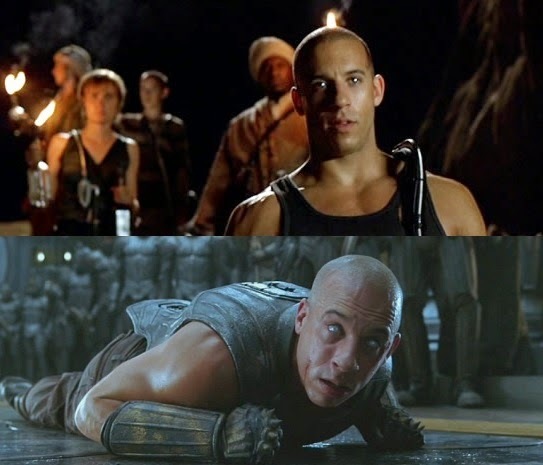 Two different groups arrive, and when they do, Riddick warns them to flee, but to leave him one of the ships. From there, the film turns into a three-way struggle as the two groups of bounty hunters compete to get Riddick for their own reasons and Riddick works to eliminate them so he can take one of the ships and leave... at least until they realize that a storm is coming and once the storm comes, blood-sucking creatures who live in the rain will come try to kill them. Sound familiar? On the surface, I should have loved this film. The story itself was well written, the design of the film is excellent, and it was all well shot. Diesel remains an excellent actor and Riddick remains an excellent character. Yet, somehow, the more I watched this film, the less I liked it. And by the time the ending came, I really had come to dislike this film. But why? I think the ultimate answer to why I didn’t like this film was that it felt like a cliche of the entire franchise. No new ground was broken anywhere and, to the contrary, everything you saw was stolen from one of the prior two films. For example, the set up for this film mimicked that of Pitch Black, with bounty hunters replacing the random passengers of Pitch Black. The monsters who attack them in the end are virtual clones in every substantive way of those in Pitch Black. The bounty hunters feel like total knock-offs of the bounty hunters (minus the charismatic Toombs (Nick Chinlund)) from Chronicles. What's worse, none of these characters had a real personality. They just stood around acting tough by standing very still and whispering death threats at each other. That got old fast. More fundamentally, however, Riddick featured a change in Riddick's character that suddenly made him very hard to like: he became arrogant. 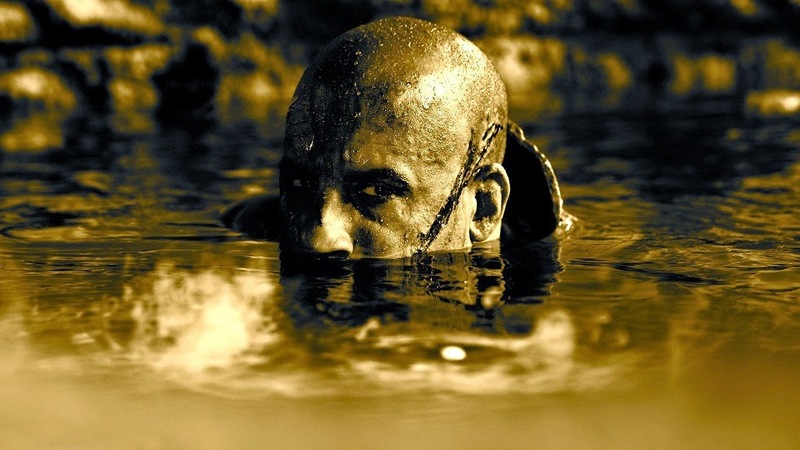 When Riddick was first introduced in Pitch Black, he blew me away. Here was a character who made the toughest of tough guys look soft, but at the same time, he was awash in traits we like. For example, Riddick never blew his own horn by telling us how tough he was. Instead, his nemesis Johns told us how tough he was. For his part, Riddick downplayed his own toughness. Riddick also demonstrated right away that he wasn't the cold-blooded killer his character was presented as. To the contrary, he offered help, guidance and moral support to the other characters. Indeed, he quickly became their leader because he had such strong leadership traits. Combining this with his desire to remain isolated and the other characters' fear of him created a wonderfully ironic situation where they needed him on many levels, but no one knew if he could be trusted except you the audience. That built a lot of trust and pulled you into the character; it made you like him a lot. Even in Chronicles, where they raised Riddick's profile by declaring him a sort of dark messiah as the last of the Furian race and as the one destined to destroy the Lord Marshall and bring down the Necromongers, Riddick still remained self-effacing. In comment after comment, Riddick disclaims any desire to be involved, points out his own lack of education and his lack of ability to change the world. And the few times he was called upon to prove his toughness, he did it with his actions and a minimum number of words. This gave him a sense of humility and continued his reluctant hero character, both of which are traits we like in our heroes. This made Riddick really easy to like. You knew he was tough, and the fact he didn't need to tell you how tough he was only made it all the stronger. You also laughed at his jokes and you smirked when the stupid bad guys took his self-effacing comments as an invitation to test him. But in Riddick, that character is gone. In Riddick, Riddick is presented as essentially invincible and he knows it. He comes across as a predator who spouts off smug one-liners and spews arrogance. There is no humor in his approach to others. There is no sense that he wants to help others who find themselves in trouble. To the contrary, his motivation seems to be revenge. 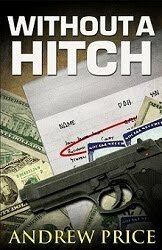 He even plays with the main bounty hunter's emotions when he discovers that the man is here to find out what happened to his son, Johns from Pitch Black. This is a cold-blooded Riddick who is very hard to like and who offers little to liven up the story. This is why I couldn't get into this film. The story and set up are entirely stolen from the first two films; there is nothing original. And what they have copied, they copied in style only but without the critical substance which made it all such fun. Add the lack of any goodnatured bad guy for you to sort-of cheer for along with Riddick, and Riddick changing from self-effacing, funny and misunderstood superhero into cold-blooded, smug predator, and you have a film that lost everything that set the first two film apart. It's no wonder the film made less than a third of the others and just over a third of its budget. I liked the first act, before the bounty hunters show up, where Riddick has to survive alone on the hostile planet, adopting the alien dog-thing. It reminded me a bit of a modern, well-made version of Robinson Crusoe on Mars (1964). The rest of the movie? Eh. I liked it. To me it was Pitch Black with Chronicles budget. But I can't argue that it offered anything new. And yeah, Riddick does come of more arrogent than in the first two movies, but he was the leader of a galaxy conquering swarm of warriors who viewed any sign of weakness as an invitation for death. Once again, to each his own. Ooops, that should read arrogant, not arrogent. I really enjoyed Riddick, whilst acknowledging that it was a complete rehash of the original movie. As to the arrogance that is easily explained, as shawn says he was the leader of army where weakness would lead to death and he has proved time and time again to be an apex predator. he only saved them in the end when he and Fry fight at the plane and she says she would die for them, which intrigues him. And I say the scenes of him messing with Johns father as a test. To see if he was like his son and to string him along so he doesn't try to kill him too soon. He was playing with all of their minds and as I said, as they were bounty hunters he didn't care about them, though he did learn to trust a few of them and them him. Watched on it's own it's great, it does lose something when you take into account that the plot is a rehash of the first movie. But it is done well and if you are going to do a good rehash of a movie, pick a great movie to rehash which they did. I loved Chronicles so much as it was completely different from Pitch Black (and a good movie on it's own) so Riddick does suffer in that sense and it will end up placing third favourite among the movies to me. But it is still a great movie which I will watch again, like I have for the first two movies. Saying all that, I can understand why people didn't like it. Agree with Backthrow that it was good until the bounty hunters arrived. Luring them there to get off the planet was clever, and the story stayed interesting while Riddick was evading them. To a degree, I see Riddick's arrogance as playing off his reputation. With that in mind, a better film would've come of Riddick manipulating the two teams against one another until they had no choice but to give up a ship. The ticking-clock element was necessary, but the storm/monsters were a total bust. Why would there be a bounty hunter outpost on such a planet to begin with? A million other ideas could've been better. Backthrow, I had the same thought. It started like a Robinson Crusoe on Mars and it seemed to be headed in an interesting direction. But once the bounty hunters arrived, it became rather generic. 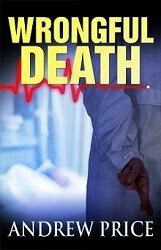 Shawn, The setup was definitely Pitch Black with a Chronicles budget, but the writing never quite approximated Pitch Black for me. I found the passengers totally fascinating all on their own and would have enjoyed Pitch Black even without Riddick. 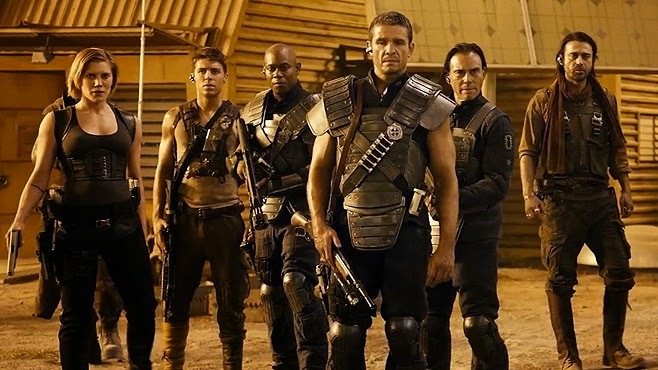 I would not have watched this film without Riddick because the bounty hunters were too generic and too similar to me. Scott, I think your explanation is correct, and I don't disagree that those are easily seen as the reasons for the way he behaves. That said, I found it made the character hard to like or care about. It lost the thing that made him so special during the other films -- his sense of calm humor as the rest of the world burns out of control around him. In terms of separating it from the prior films, I think I would have liked this better if I didn't have the first two films to compare it to. That said, however, I know I would not have liked this nearly as much as I liked Pitch Black when I first saw it. I suspect I would have seen this as a decent, but not ultimately fulfilling science-fiction-action film, whereas Pitch Black really blew me away as something special. tryanmax, I too felt the storm/monster idea was a bust. It came on so suddenly, without any real warning, and it was over before you knew it. If you're going to do something like that, the best part of it is watching it build and watching the characters trying to prepare for it. This film kind of short-circuited all of that. I think the idea of the two teams competing would have been better. Ultimately though, I would have preferred something entirely different like Riddick discovering some alien world beneath the surface. And while I concur with everyone commenting irt Riddick's arrogance, I think he went a bit overboard. I prefer the darkly funny Riddick to the overly arrogant one, although there was some flashes of dark humor I did like in this film. Not sure if this is a direct quote and too lazy to look it up, but I particularly liked when Riddick said: "There are bad days then there are legendary bad days." But yeah, Riddick could've been a lot better, although it wasn't horrible. Thanks Ben. I don't think the movie is horrible by any stretch, I just found it far inferior to the first two. There is still some humor, but to me, the character has lost the sense of humor he had in the prior films. That was something I really liked about those films. His one-liners in particular was often hilarious. This time, they're just tough guy stuff. I thought Riddick was crap. Totally devoid of suspense and just filled with weird behavior on Riddick's part. The fact that alien army left him on the planet like one leaves a puppy by the side of the road was pretty damn funny (more entertaining that the rest of the movie) even if it probably just means that they didn't have the budget to make Riddick the commander of a galactic army. I can't figure out why Riddick didn't just take a ship and escape at the movie's halfway point instead of mess around with a bunch of hideously stupid mercenaries and CGtastic monsters. Oh my gosh, I totally forgot I watched this movie. It was so forgettable. That's saying something as I'm a huge SF fan. I think the second installment in 2004 had so much potential. Whilst the author of this blog is interested in the Riddick character, I felt the man was the least interesting of all because he simply didn't represent his Furyan background convincingly. However, it wasn't Vin Diesel's fault at all! I don't like his characters, but I do not blame him. His Furyan character was carried by (1) Shirah, the girl in his dream, (2) Aereon (Judy Dench) and (3) the revelation by the Quasi-Dead. Riddick's role was to be defiant of everything, like a petulant child. I suppose Vin Diesel is to remain the shallow tough guy who thrives on the goodwill of everybody else who are willing to apologize for his character.